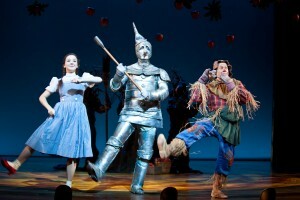 Maeve Moynihan, Max Wojtanowicz and Dean Holt in The Wizard Of Oz. Photo by Dan Norman. CTC’s The Wizard Of Oz (Childrens Theatre Company, through Jan. 8, 2012) imitates the 1939 MGM classic beat-by-beat: the structure is identical, the character conceits, the exquisite Arlen/Harburg songs. Much of the play’s dialogue comes directly from the movie. All the classic lines – “I’m not a witch at all!” “Who’d’ve thought a little girl like you could destroy my beautiful wickedness?” – are perfectly preserved. This production makes almost no effort to assert itself, to give Oz a distinctive 2011 spin (except, occasionally, in the set design; more on this in a moment). This means that unless you’ve been living on the planet Mizar-5 you know this story thoroughly. Ditto your child (she may seem to be watching the TV screen passively, but in fact she’s bringing a steel trap mind to bear on the movie and is memorizing every moment). The CTC production caters to our memories of the film – Yes, just like that! – and offers little meaningful discovery. This also forces the CTC performers to go mano-a-mano with Judy Garland, Bert Lahr, Margaret Hamilton, et al, actors who give what is universally acknowledged to be among the finest performances, ever. The CTC cast, no matter how good (and they are excellent), suffers in comparison. A reviewer is forced to say things like, yes, Maeve Moynihan has an infectious pixie-ish smile and super-sweet presence but she lacks Garland’s calm emotional depth; Jennifer Blagen holds the stage beautifully as the Wicked Witch, ah, but she doesn’t have that taut Hamiltonian scariness. It hurts. Enough with the Crabby Critic rant. All right, yes, this is an unoriginal take on the story, underlaid with money-making cynicism. But this Oz works, and works well. Everyone gasped when Miss Gulch kidnaped brave Toto; adored the dancing quartet (Dorothy with the Scarecrow, Tin Man and Cowardly Lion); hissed at the Wicked Witch (that long green nose! ); jumped when the booming voice of Oz filled the theater. At the end of the show I heard moist weeping and felt rapt attention. The latter is specially meaningful, as this play is on the long side for children’s theater. The audience was entranced. The area where the show does explore new territory is in the set design and here director Peter Rothstein along with designers Scott Bradley (sets) and Paul Whittaker (lights) earn high marks. Times being what they are, budgets are more modest and Rothstein and Bradley have fashioned a seamless and very creative take on The Wizard Of Oz. It’s a big production, but they keep it moving. I attended a Saturday matinee. It seemed to be Grandma and Grandpa Day – lots of older play-goers taking young children to the theater. This gave me an idea: why not let your parents take the darlings to see this show while you enjoy a well-deserved and child-free rest. For more information about John Olive please visit his website.